Indulge your senses and reward yourself—without compromising your commitment to your body. MacaSure Chocolat is permission to succumb to your chocolate craving, apology-free. Each deliciously decadent bar of MacaSure Chocolat contains 4000mg of premium, organic maca, renowned for its hormone-balancing, energy-increasing and libido-enhancing properties. 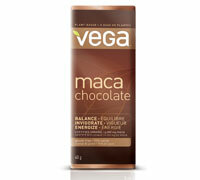 Blending the benefits of maca with the power of rich chocolate is sure to arouse the desire of even the most health-conscious taste buds. MacaSure Chocolat is organically grown and fairly traded.